* Muncie, IN property not shown on map. Magnus Commercial Properties is a Salt Lake City, UT based commercial real estate firm. Previously known as JMP Net, the company was founded by John M. Potter in 2009 for the purpose of investing in triple net leased properties. Not to limit its opportunities, the company takes a diversified approach to its real estate portfolio, expanding beyond net leases into the self storage and hotel industries. Being flexible and financially liquid has allowed Magnus Commercial Properties to start and grow its business in difficult economic times. In 2009 Magnus Commercial Properties began its acquisition phase to take advantage of depressed prices in real estate. 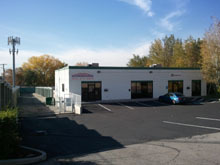 The company's first purchase was a commercial space in Lehi, UT. In 2010, the company moved from purchasing to development and into the hotel space as it began its first hotel project. Magnus Commercial Properties opened its second hotel project opened in 2014 and plans to open additional hotels in the near future. Magnus Commercial Properties continues to invest in the hotel asset class while also seeking out additional new development opportunities. Magnus Commercial Properties and its owned affiliates, in total, currently has sole or managing partner ownership interest in over 600,000 square feet of commercial space on 37 acres. Its properties are diversified across the Retail, Self Storage, Industrial/Manufacturing, and Hotels/Lodging sectors. Magnus Commercial Properties is proud and happy to regularly work with a diverse and successful group of tenant-partners and co-management companies. Copyright © 2019 Magnus Commercial Properties. All rights reserved.